On a balmy evening in early March 2014, a handpicked crowd of sixty of Hollywood’s richest and most powerful VIPs gathered at the at the art-filled Malibu mansion of Arnon Milchan for an intimate evening with Benjamin Netanyahu. Milchan, billionaire businessman and Oscar-winning producer pulled out all the stops for his old friend. The evening’s guest list included everyone from Clint Eastwood, Barbra Streisand, Anthony Hopkins, and Leonardo Di Caprio to Avatar director James Cameron, and Rush Hour producer Brett Ratner. The crowd listened raptly for an hour as the Prime Minister delivered his spiel. 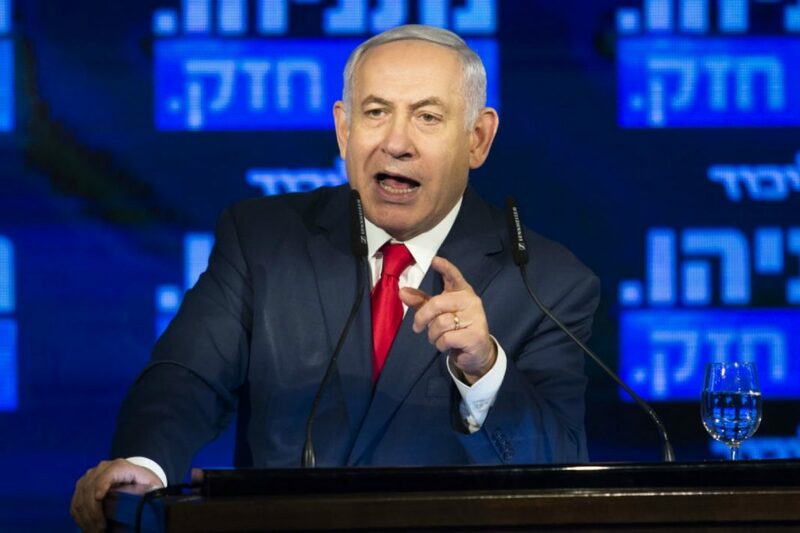 “Bibi” Netanyahu had arrived on an official trip to Washington several days earlier, where his boisterous crusade against the Iran deal had infuriated senior officials in the Obama administration. After two days of tense White House meetings, the convivial L.A. lovefest Milchan had arranged must have been a relief. The Prime Minister brought along his wife, Sara, and their son Yair, a 21-year-old who dreamed of becoming an actor. They all seemed delighted to be mingling with the biggest movie stars in the world. Both Netanyahu and Milchan were at the top of their worlds at that moment, and at the peak of a friendship that was both political and personal. Netanyahu had recently won re-election in a tight race. His reputation as a behind-the-scenes political king maker dates back decades. Once a moderate, he threw his support to the conservative Netanyahu after 2009, when Bibi re-took Israel’s highest post. Over the next few years, Milchan and Netanyahu became close friends and confidantes—often speaking several times a day. When he was in Los Angles, where he lived half the year, Milchan often acted as Netanyahu’s unofficial counsel general, assisting Hollywood’s top celebrities on trips to Israel and arranging visits with government officials. “Everybody knew (Milchan) was the guy to call about Israel,” said a top Hollywood studio executive. “He also serves as the primary host of Hollywood’s elite when they come to Israel, usually at his initiative,” the book says. Listening intently as “Bibi” spoke, was Aussie billionaire casino exec James Packer. Milchan had been a business partner of his late father, Kerry Packer, and now was advising him on investing in movies. Listening to Netanyahu that night, the recently divorced Packer had something of an epiphany. He took the PM’s invitation to visit Israel seriously and fell in love with the country. Packer, who is not Jewish, bought a $2 million seaside estate near Netanyahu, and for a time was a regular visitor to the PM’s home. Netanyahu also managed to squeeze in some show business during his 2014 L.A. trip. He spoke after the premiere of Israel: The Royal Tour, a CBS documentary by Peter Greenberg. Surveying the rows of A-listers that Milchan had rustled up for the occasion, even he was impressed. “Am I at the Oscars?” he quipped. In fact, Milchan had just returned from the Academy Awards days before Bibi’s visit, where he took home the best picture Oscar for his film 12 Years a Slave. During his visit Milchan and Netanyahu seemed inseparable. No one would have guessed that five years later, Milchan would be the lead witness in an ugly corruption scandal that may send his onetime friend to jail. Milchan inherited a fertilizer business at age 21 when his father died, and soon built it into an international chemical company worth over $125 million. The company helped make the Israeli deserts bloom and gave him international connections. He expanded into petro chemicals, agriculture, aerospace and more. A savvy trader, Milchan bought European athletic shoe-maker Puma in 1997 for $150 million and sold it six years later for almost $700 million. He got involved with the government through his friendship with Shimon Peres, then Minister of Defense. In the now notorious 60 Minutes interview, Milchan recalled his early espionage career. ‘You know, I could help you guys. '” He told Peres. And he did. Over the next two decades, while running businesses in dozens of countries, he secretly worked for Israel’s intelligence service, acquiring technology and weapons. He told Steve Kroft he had helped Israel sell arms to countries that couldn’t buy them from the U.S., such as the government of South Africa. “Milchan was one of Israel’s most assertive and effective secret agents,” Doron, author of the Milchan biography, told the Jewish Journal in 2018. “For years, he had given bribes in the millions to people in power, agents and state officials in order to advance Israel’s interests.” That included sourcing uranium from South Africa when Israel was developing the only nuclear weapon in the Middle East, eventually with the U.S.’s blessing. As their friendship deepened, Milchan got help when he needed it from the Prime Minister. He won Bibi’s support for a deeply unpopular measure that came to be known in Israel as the “Milchan law.” It offered generous tax benefits to rich Israelis like Milchan who return home. The measure passed in 2008. But as Milchan explained to Cigar Aficionado in a 2008, his efforts on behalf of his homeland were not fueled by self-interest. Milchan also believed that he could bring the Jews and Arabs together. According to biographer Joseph Gelman, the roots of Netanyahu and Milchan’s eventual disenchantment were planted in 2013, when Milchan gave an ill-advised interview to Israel’s version of 60 Minutes, Uvda. In the interview Milchan detailed his secret work acquiring technology for the country, some of it used for atomic bombs. “I did it for my country and I’m proud of it,” Milchan said. Gelman claims that the revelations led the U.S. to deny Milchan an extension of a ten-year residence visa, jeopardizing his Hollywood career. In desperation, Milchan turned to Netanyahu for help. The PM made calls to then-U.S. Secretary of State John Kerry and got him to intercede. Milchan got the extension, Gelman says, but for a much briefer period. His indiscreet TV appearance also stirred up the interest of the Israeli police, Gelman believes: “It was the thing that triggered the first investigation, and then the next, like a cascading effect,” eventually leading to the “gifts” scandal that may bring Netanyahu down. Beginning as early as 2013, Milchan expressed his gratitude to his friend Bibi by providing gifts— starting with $55 Cuban cigars Netanyahu chain smoked and pink champagne for his third wife, Sara. By 2015, the gifting had become so expensive Milchan recruited Packer, who had bought a home in Israel, to help carry costs that eventually exceeded $200,000. Netanyahu insisted the cash and products he received from Milchan were just gifts from a friend, and borrowing a page from his friend Donald Trump, dismissed the investigation a political witch hunt. Israel’s Attorney General disagreed, eventually charging the PM with taking bribes to gain influence and political favors. When he was interrogated by Israeli authorities, Milchan told them he felt he had to acquiesce to the Netanyahu’s increasingly outlandish requests. His accusations were corroborated by Milchan’s assistant, Hadas Klein, who had been in charge of “supplying the goods” to Netanyahu. Once, when Mrs. Netanyahu demanded Milchan and Packer’s construction supervisor come and direct her staff, Klein balked. “Sara yelled at me,” she said. “She screamed that Milchan and I humiliated her and Bibi by not approving things that are supposedly permitted to them. After a two-year police investigation, authorities announced Netanyahu faced criminal indictments. Police also said on Dec. 2, 2018, they intended to indict Milchan. At first, Milchan firmly denied there was anything improper in his relationship with the Prime Minister. But after police warned him that he could also be indicted, his story changed. “During the course of his third round of questioning, Milchan supplied a new account implicating Netanyahu,” reported Jewish Business News. The information he provided to authorities resulted in three criminal indictments against Netanyahu for corruption and self-dealing. When the charges were officially announced by the Attorney General last February, he made sure to note that no charges would be brought against Milchan, who is expected to testify at the hearing. Packer was interviewed by Israeli police in Australia, and won’t be indicted. He too may testify. In recalling his efforts for Israel, Milchan told the Hollywood Reporter in June 2016 that he doesn’t regret doing all he could for his country. His goal of brokering peace among Jews and Arabs, however, remains as elusive. Previous articleCalifornia Congressman Eric Swalwell Is Running for President—but Why?